These Cheetah were not actually at Etosha. We saw them at a farm on the way there. I think nobody had a favourable impression of their gaoler, who seemed to hate Cheetahs but found he got a useful income from exhibiting these. 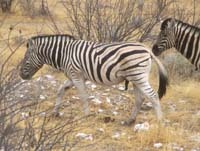 Etosha has lots of wildlife. We met this Impala soon after entering the park. 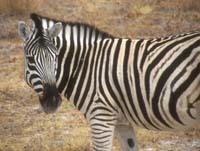 There are many Zebra and the details of their stripes contrast them with Zebra in other areas. 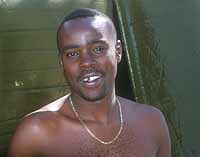 A great feature of Okaukuejo Campsite, was the nearby waterhole which was floodlit throughout the night. To view an extra set of photos by Roger Lalonde, click here. 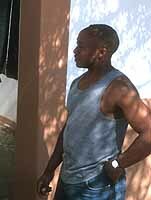 The last visit of our trip was to Waterberg. A large flat-topped hill rose above the campsite there and it was possible to walk up it. The views of the surrounding countryside were good from the top. The walks up and down were good too. 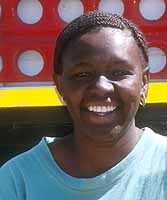 Pascaline who fed us with delicious food and kept the camps so well. This is the miracle ingredient of our trip! Nobody was ever ill. This was largely due to the system of hand-washing and disinfectant always used before meals.